One of the best ways to expand your cooking repertoire and to learn new recipes, techniques and get inspiration for your own creations is to try out other peoples’ recipes. I’ve got an extensive cookbook collection that I love to dip into but magazines and food blogs are also a great place to find new recipes. The best thing about getting inspiration from food blogs is that they’re the recipes of real people. Real people with jobs and busy lives and normal kitchens, not professional chefs with access to equipment and ingredients that the rest of us don’t have. This makes the recipes more accessible to the average person and appropriate for every day and not just dinner parties. I also find that reading other food blogs is a great way of finding out about different types of cuisine and different ways of cooking. I’m a big fan of vegetarian and vegan food blogs as I find that they approach recipes and cooking methods in ways that, as a meat eater, I wouldn’t think of because I don’t necessarily need to consider the limitations of a certain diet. One of my favourite new discoveries, to me at least, is The Minimalist Baker. Husband and wife team Dana and John run the blog together and it features an extensive catalogue of recipes which are mostly vegan and/or gluten-free due to their own dietary requirements and lifestyle, all of which they’ve made really accessible to their readers by making the recipes as simple as possible and with 10 or fewer ingredients. I love having a browse through for recipe inspiration. I was actually introduced to The Minimalist Baker by my good friend Raquel who eats a mostly vegan diet, and to this recipe specifically because she sent me pictures of the ones she made. 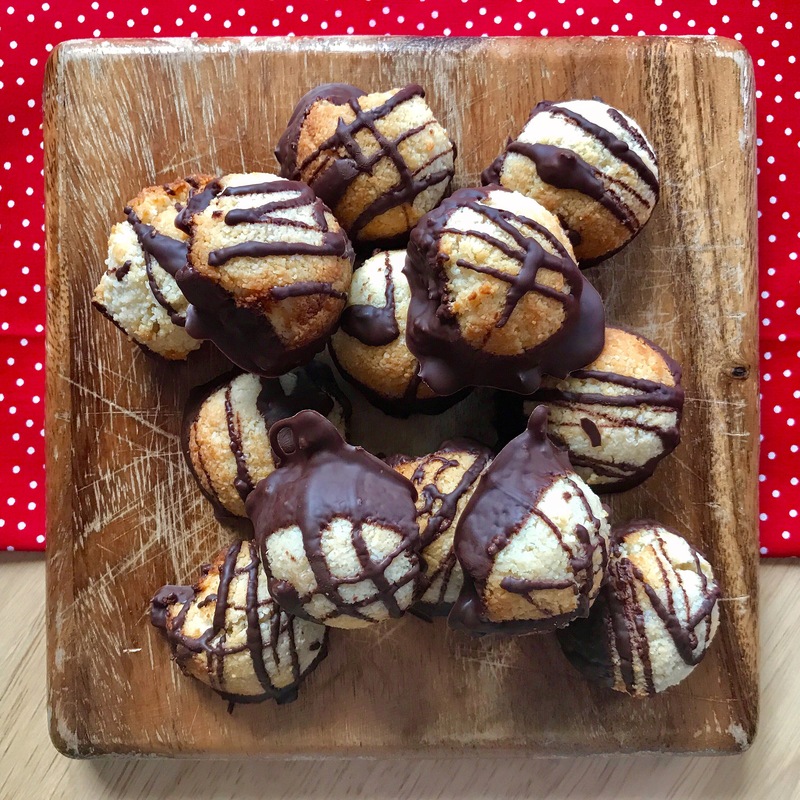 These macaroons are insanely easy to make and I already had most of the ingredients in my baking cupboard! I made a couple of adjustments to the original recipe, mainly because I found some orange flavouring The Boyfriend had bought in the cupboard and thought ‘Ooo, that’ll work!’ and threw a few drops in. I also had quite a lot of chocolate left after the dipping stage so I drizzled it over the top for extra decoration. These tasty little treats make a great snack and went down very well with The Boyfriend. I also think they’d make a great foodie gift, pop a few in a little cellophane bag and decorate with some fancy ribbon and they’d make a lovely homemade present for someone. 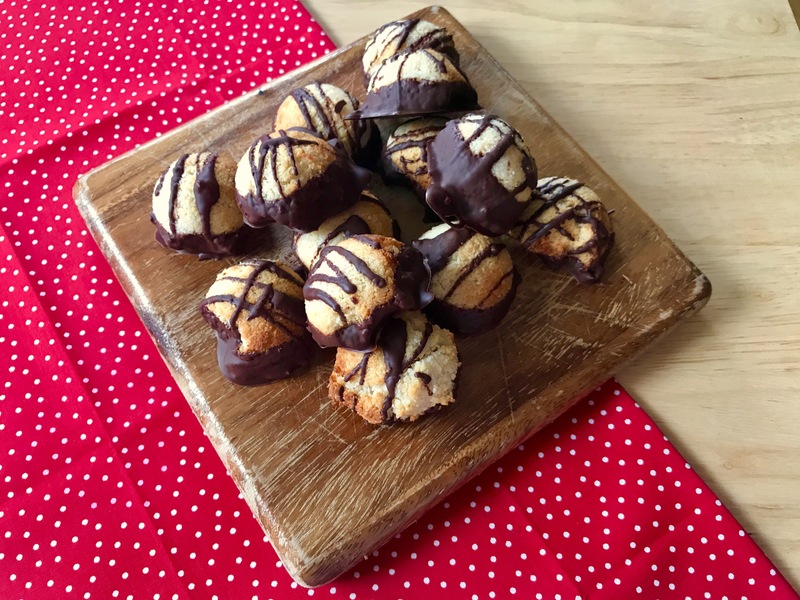 I’ll definitely be making these again, next time I think I might try them out with some peppermint extract as I think the flavour would really work well in this recipe.